Visit the Colts' official website for your daily fix of team information. Colts, Jets, Chiefs among teams potentially interested in trading for Seattle's franchise-tagged defensive end Frank Clark, NFL Network's Ian Rapoport reports. The Colts finished 20th in rushing yards last year. Second-year head coach Frank Reich wants to change that in 2019. Reich wants Indy to be a "top-five, top-seven, rushing team." The Colts were initially patient in free agency before Chris Ballard reeled in big fish Justin Houston. Indy owner Jim Irsay appreciated his GM's disciplined approach, believing it will pay off later. The Colts are hosting ex-Broncos edge rusher Shane Ray for a visit, NFL Network Insider Ian Rapoport reports. The Broncos parted ways with the former first-round pick after four seasons. Justin Houston has a new team and a new position. And after being cut by the Chiefs and signed by the Colts this offseason, the star pass rusher has plenty of motivation. The Indianapolis Colts have agreed to terms on a deal with former Chiefs linebacker Justin Houston, the team announced Thursday, Houston totaled nine sacks during the 2018 season. Clayton Geathers started a career-high 12 games in 2018. He's slotted to be the Colts' starting strong safety in 2019. 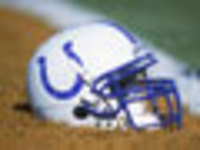 Indianapolis announced Wednesday that it re-signed the fifth-year veteran. Colts coach Frank Reich said earlier this week that Indy's locker room is "not just open to any great player. You've got to be the right guy. You've got to be the right player." Colts general manager Chris Ballard confirmed Wednesday at the NFL Scouting Combine that Pro Bowl tight end Jack Doyle recently underwent hip surgery but is expected to return by training camp. Across from T.Y. Hilton, Indianapolis does not currently have a bona fide No. 2 option, but one of the Colts' leading pass catchers from 2018, Dontrelle Inman, is hoping he can fill that role next season and beyond. The Indianapolis Colts are bringing back longtime NFL offensive line coach Howard Mudd and also signed Klayton Adams as assistant offensive line coach. Indianapolis Colts LB Darius Leonard was named the NFL's 2018 Defensive Rookie of the Year during Saturday night's NFL Honors. Leonard led the league in total tackles, and tallied seven sacks. Colts QB Andrew Luck decisively beat out J.J. Watt to earn Comeback Player of the Year honors. Luck missed the entire 2017 season and went roughly 18 months without throwing due to surgery on his throwing shoulder. Indianapolis signed guard Mark Glowinski to a three-year extension, avoiding free agency, and therefore bringing back all five starters for the Colts' offensive line. At 46 years young, Adam Vinatieri is headed back to kick for the Indy. The Colts signed the future Hall of Fame kicker to a one-year contract. The Indianapolis Colts parted ways with offensive line coach Dave DeGuglielmo, NFL Network's Mike Garafolo reported, a move the team later confirmed. Colts backup quarterback Jacoby Brissett is entering the final year of his rookie deal but Indianapolis has no intention of dealing the signal caller unless they are bowled over by an offer. Adam Vinatieri might've had the worst game of his future Hall of Fame career in Saturday's loss to the Chiefs, but he has no plans to hang up his kicking boot. Following the Colts' lost to the Chiefs on Saturday, Indianapolis receiver T.Y. Hilton finally went into detail about the ankle injury he's been playing through during his team's hot streak into the playoffs. For a second straight game, the Colts will be without defensive lineman Tyquan Lewis (knee), who was downgraded to out for the Divisional Round versus the Chiefs. 4/22 Evan Boehm (OG) No Offer Sheet Executed (no offer sheet executed). 4/15 Matthias Farley (DB) No Offer Sheet Executed (no offer sheet executed). 4/15 Marcus Johnson (WR) Exclusive Rights Signing (exclusive rights signing). 4/15 Chester Rogers (WR) No Offer Sheet Executed (no offer sheet executed).